Stephanie, thank you for sharing this video with everyone. I have a question about clothing and the colostomy. I am a larger women and I find that if my clothing covers my ostomy bag when I go it just collects at the top of the bag versus going to the bottom. Have you or anyone else had this issue? If so what did you do to fix the issue? I am glad I had my “stoma” baby in 1983 when we sore more flowing maternity clothes. You ladies wear way more form fitting maternity clothes. The elastic band on my maternity pants often hit right over my stoma. If I ballooned up, no one could tell since I had a loose maternity top on. 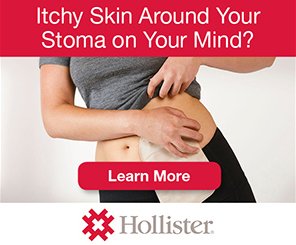 No one knew I had a stoma! I had a great pregnancy and had a 9 lb baby boy, via vaginal birth. Although I’m not a female , I can sympathise a bit , with the ‘challenge’ of trying to ‘disguise’ a ‘bag’ when pregnant . I too am an ostomate , & prefer not to wear certain clothes , which will highlight my stoma , instead choosing loose , dark or patterned material . My wife & I had 4 children [ all adults now ] , but now have 6 Grandkids , 8 & under , so from a male’s point of view . When my wife was ‘carrying’ our babies , the fashion then ,was loose Maternity style dresses ………But really…..why should we ‘have to ‘ disguise our stomas / bags ? The more people know about ‘ What a Stoma is ‘ , the better !! !,,,,but it takes courage ! This is the exact video I’ve been looking for. I’m TTC my second baby right now through IVF and I have a permanent ilesotomy. Thank you!